SocNetV v2.1 has been released! your social network research real fun! Navigate yourself and use the application either with the mouse or the keyboard. Load and save to GraphML, but you can also import most network file formats (GML, Pajek, UCINET, GraphViz, Adjacency, EdgeList etc). 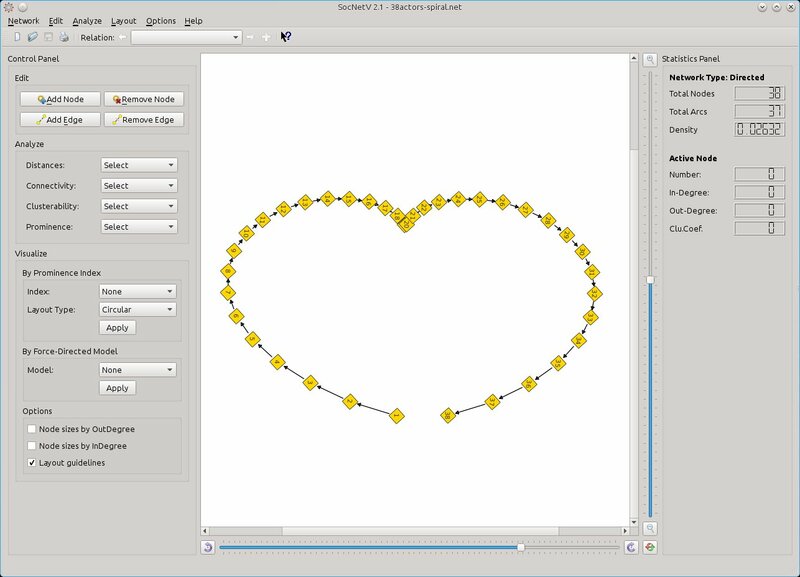 Apply intuitive visualization layouts on undirected/directed graphs, based on prominence scores or force-directed models. Easily visualize and analyze networks of linked web pages and sites through the built-in web crawler. Work with multiple relations concurrently. SocNetV supports loading, editing and saving multirelational social networks. SocNetV is Free and Open-Source Software, use it everywhere. Have a feature request? Ask us! Use the buttons to download Social Network Visualizer for your OS or to learn more about Social Network Analysis and Visualization reading the Manual .